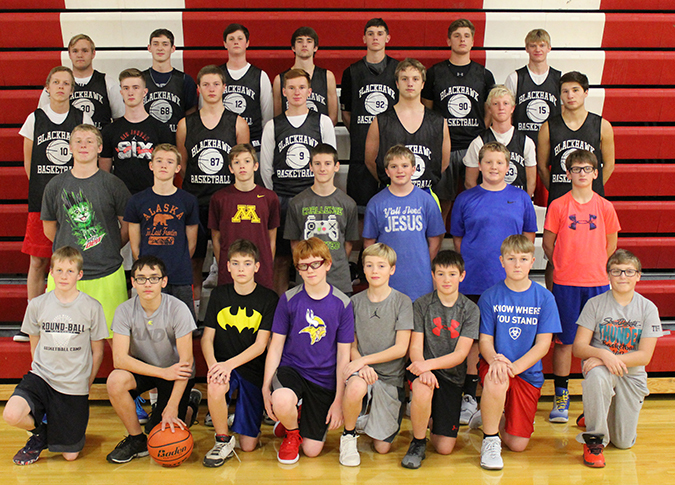 Members of the Blackhawks boys’ basketball team in grades seven through 12 for the 2018-19 season are front row, left to right: Evan VonEye, Gabe Freidel, Dylan Klich, Michael Hoffman, Aiden Lieber, Westin Hagman, Trey Moody and Carver Lindsey; second row: Toby Kneen, Coen Harvey, Cody Slykhuis, Jeff Boschee, Chase Linn, Cooper Goldammer and Carter Christian; third row: Tryce Slykhuis, Ryan Poyer, Andrew Lindgren, Spens Schlicht, Phillip Hines, Mason Moody and Trey Ulmer; back row: Kadin Schlenker, Sawyer Senska, Cayden Slykhuis, Malachi Bruce, Tater Moody, Noah Dickson and Austin Schmit. The 2018-19 basketball season is upon us, and both girls and boys basketball teams show great promise and potential for a successful season, but not without some changes being made. Both the boys and the girls have new players to fill in some important roles left open from graduating players on last year’s teams. Along with that, some coaching responsibilities will be slowly changing hands, with the complete switch to come at the end of the season. …Read on and see the schedule in this week’s issue of the Sanborn Weekly Journal!